Career Directors International is proud to announce the 2014 recipients of the President’s Award for contributions to the organization, its mission, and its programs. The individuals recognized represent professional resume writers, career coaches, and other career professionals. It is at this time each year that CDI is excited to recognize those members who have made a significant different to the organization and its value to both job seekers and other industry professionals. 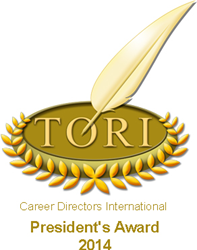 Career Directors International (CDI) is a membership-based organization made up of resume writers, career coaches, and other career professionals from around the globe. They come together to grow their businesses, earn industry certifications, and gain support in their development. It is at this time each year that CDI is excited to convey the President's Award to recognize those members who have made a significant different to the organization and its value to both job seekers and other industry professionals. Because CDI members are up-and-coming and established experts, many of the industry resources that are developed rely on their contributions. This allows CDI to source some of the most up-to-date expertise while providing members with a venue for contribution, credibility as an author/contributor, networking, and advanced learning (since many roles require research and staying up-to-date on the newest trends in resume writing, job search, interviewing, social tools, and more). CDI volunteers may contribute to development of best practice tip sheets, selection of conference and webinar presenters and their topics, industry surveys and requisite reports, job seeker blog posts, and overall organization guidance as in the case of CDI board members. Each year 1-2 members truly stand out and shine with the contribution they make to CDI as a volunteer. 2013 was a unique year in that CDI did not give out an award, because they simply couldn't narrow it down to the most deserving few. Thus, in 2014 when they same thing happened, President Laura DeCarlo decided that CDI’s small group of volunteers is MIGHTY in all that they do. To recognize a few would be blasphemy when all equally gave during the past year. So, for 2014, it is no CDI volunteer left behind year" as we recognize all year-long volunteers with a President's Choice Award. But, in all truthfulness, these individuals earned their recognition! Once again, we say thank you to these individuals and all that they do for CDI each year. To learn more about CDI, please visit http://careerdirectors.com/.